Norwegians were winning lots of World Cup ski races on two continents during the weekend, but they pale in comparison to the victory scored by marathon runner Sondre Nordstad Moen in Japan. 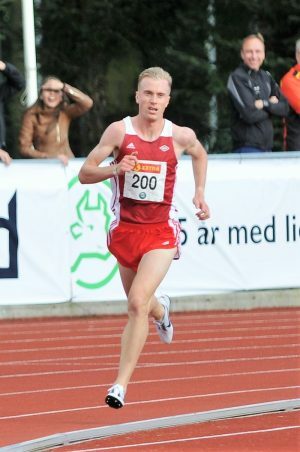 Moen won the Fukuoka Open International Marathon, and became the fastest European in history. Moen ran the 26-mile course in just two hours, five minutes and 48 seconds, beating his own record and resulting in an average running time of 20 kilometers an hour. No European has ever run faster over such a distance. Moen is 26 himself and comes from Trondheim, coincidentally the same hometown of Norway’s new skiing wonderboy Johannes Høstflot Klæbo, who won all the World Cup cross-country races in Lillehammer over the weekend. Klæbo skied 30 kilometers (18 miles) in an hour and 16 minutes, but the distance was less than the roughly 42 kilometers Moen faced, and skiers can go faster than runners. Moen’s time was so good that he’s now favoured for the gold medal at the European Championships in Berlin next year. “I was sure I could run with a time of 2.07 and maybe a good 2.06,” Moen told the international athletics federation IAAF after his historic result. “I hadn’t expected 2.05.” He ran in the Summer Olympics in Rio last year, but finished 19th. Moen said that everything clicked for him in Japan: “The weather was good … and I had a lot of energy left towards the end,” he said. Moen, who represents the sports club Vidar in Norway, told newspaper Adresseavisen before leaving for Japan that he’d been training at a camp in Kenya and would fly back to Oslo, where he now lives, after the marathon in Fukuoka. Then he planned to spend the Christmas holidays back home in Trondheim.